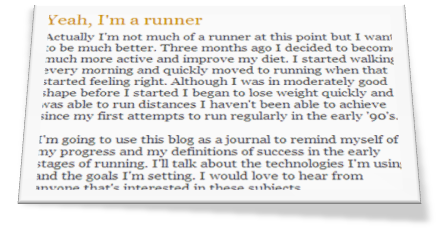 Almost three years ago I published my first post on the Emerging Runner blog. The subject of the post was "Yeah, I'm a runner", a tongue and cheek joke I have with my wife about things I did one time (rock climbing, sailing a 12 meter yacht, fly fishing) and then bragged about it for weeks. But, in running, I was determined to be more than a dilettante. I was ready to commit. I started running after changing my diet in August of 2008, controlling portion sizes of my meals and making better choices with food. At the same time, I started walking, first on the treadmill and then out in the neighborhood. A month into it I started looking up the road and challenging myself to run to the corner. Soon it was a full street and eventually my walks became runs. It took about six weeks for me to transition from fitness walking to running, and my commitment was helped along with the strong support of my family and friends. I liked I how felt after I ran and I was fortunate to begin to lose weight quickly. By the time I started the blog in November 2008, I had lost over 30 lbs. No magic diet, pills, shakes or fasts. It was simply eating less and doing more. I started the blog as a journal to record my progress and as a way to tap into the community of runners. Over the last three years I've received many valuable suggestions, tried most, and adopted some. Even today, I welcome advice from runners like Paul, Dave, Adam and Brian who generously share their expertise and experience. What have I written about in a thousand posts? A look at the "tags" list on the left side of the blog will answer that question. I mostly write about my runs, but I also like to share what I've learned from other runners. I'm out almost every day, and after three years, I've seen a lot of things on the roads and trails. I often wish I'd stayed with my running back in the '90's because I'd have all that experience to draw on by now. Then I think that I might have developed bad knees from all that running and I feel better for my more recent return. 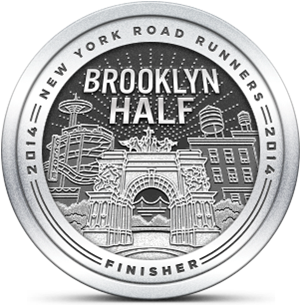 One thousand post, hundreds of runs and twenty races later, I still feel like I'm an emerging runner. Every run is different and I'm still learning new things. Running gives me a reason to write and writing demands content, so I'm motivated to run. Thanks for taking the time to read this blog and for connecting through email and comments. It's great to have friends who share this passion. I'll keep writing if you'll keep reading. Now this is one great post. Well done! Thanks Brian. Looking forward to running at Belmont Lake one of these weekends!